Don’t forget to stop by my giveaway page and enter to win $100 Visa Card with Better Breakfast, Better from Jimmy Dean. This is my new favorite tomato soup recipe. 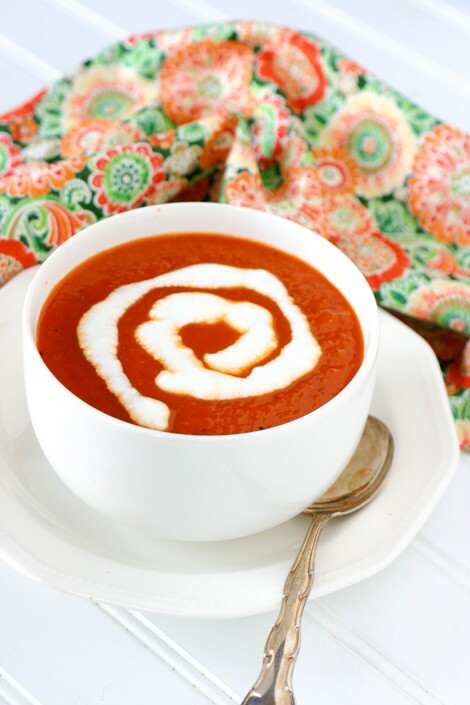 Adding red peppers to tomato soup gives a delicious and addictive quality. I served this with some delicious oven fried cheese sticks I’ll be sharing with you soon. 1. Preheat a large soup pot. Drizzle with olive oil. Add onion and saute until translucent. Add garlic and saute for 2 – 3 minutes more. Add tomatoes, roasted red peppers and their juice, chicken or vegetable stock, herbs and honey. Bring to a boil and reduce heat to medium. 2. Cook over medium for 30 – 30 minutes, or until vegetables are very tender. When soup is done, use a submersible blender, or a regular blender, in batches, to puree the soup until very smooth. Serve with a little cream for garnish. What a beautiful soup! Almost too pretty to eat but sounds too delicious to pass up!! I love roasted red pepper soup too. I’ve been buying a boxed variety from Whole Foods, but I would love to try making my own batch. Thank you for sharing such a great meal idea. I hope your weekend overflows with good food, good friends, and love!